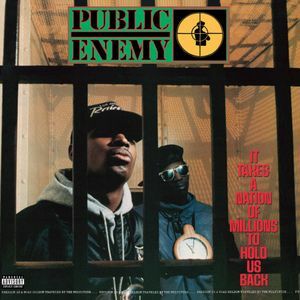 “It Takes a Nation of Millions to Hold Us Back is the second studio album by American hip hop group Public Enemy, released on June 28, 1988, by Def Jam Recordings. Public Enemy set out to make the hip hop equivalent to Marvin Gaye’s What’s Going On, an album noted for its strong social commentary. Recording sessions took place during 1987 at Chung King Studios, Greene St. Recording, and Sabella Studios in New York City. Noting the enthusiastic response toward their live shows, Public Enemy intended with Nation of Millions to make the music of a faster tempo than the previous album for performance purposes. - The album comes in at #1 on Ego Trip’s Top 25 Rap Albums of 1988. - The single ‘Don’t Believe the Hype’ comes in at #6 on Ego Trip’s Top 40 Rap Singles of 1988. - The track ‘Don’t Believe the Hype’ appears on our 1988 Rap Megamix. - The tracks ‘Don’t Believe the Hype’ and ‘Security of the First World’ appears on Classic Material 1988 Mixtape.